In 2005, Baltistan Wildlife Conservation & Development Organization (BWCDO) entered into institutional partnership with Snow Leopard Conservancy (SLC). 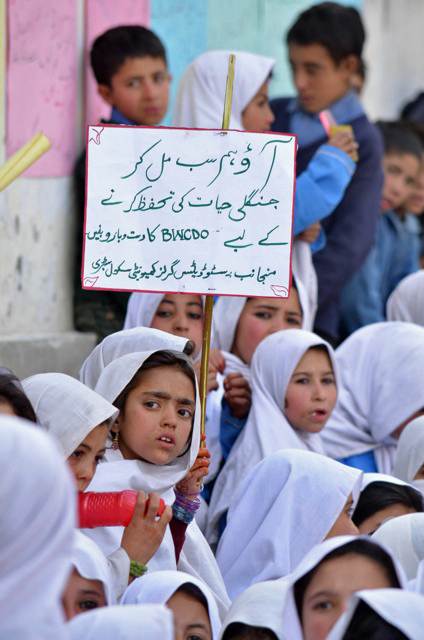 Under the agreement, SLC provided technical and financial support to raise awareness among school children in Basha Valley in Gilgit-Baltistan region about snow leopard protection. Under the conservation awareness program, BWCDO has organized cross-valley students’ visits, celebrated World Environment Day in schools and colleges, and organized debate and essay contests in seven schools in the valley. 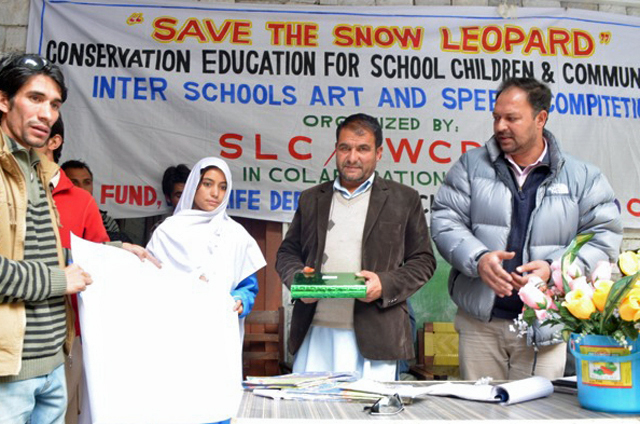 In 2012, with financial assistance from SLC, BWCDO distributed about 1,000 copies of a short informational book on snow leopards suitable for students from grades 5 to 8. The booklet contains general ecological information about snow leopards and general facts about its natural history. It also contains a short poem about snow leopard written by a local Balti poet. Seeing the enthusiasm and interests of students from grade 5-7, BWCDO decided to celebrate snow leopard day in Sibiri village in Basha valley in January 2015. Since this was the first time BWCDO was organizing this event it was held in just one village. The BWCDO team made plans with the local school teachers to organize a debate contest on that day. The news of celebration of snow leopard day, however, soon traveled to neighboring villages and on the designated day, students from neighboring villages started pouring into Sibiri in the shape of processions, chanting slogans for the conservation of snow leopard. This was a remarkable development and the BWCDO staff, the organizing committee and the participants of the snow leopard day, which included the District Wildlife Officer, and local committee members, were caught off-guard at this spontaneous burst of environmentalism among the school children of Basha. The local school teachers said that they had never seen students so motivated and charged up by conservation issues. It turned out that school children from the uninvited villages had also prepared speeches and two female students from grade 8 had written poems about snow leopard. They said they were inspired by the poem about the snow leopard in the booklet that was distributed by BWCDO. All in all about 400 hundred students from seven schools representing all the villages where SLC-BWCDO works were represented at the Snow Leopard Day celebration.